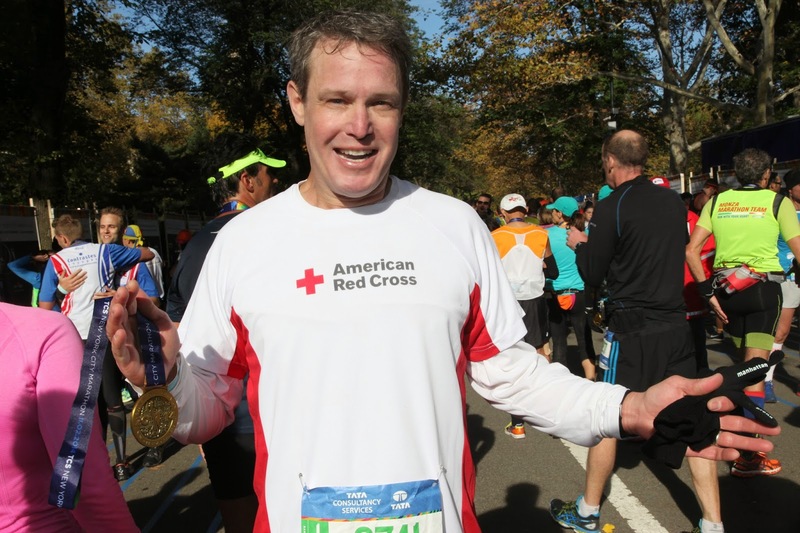 On Sunday, Nov. 2, a brilliantly clear, cold and windy day, Mark Shelton, a member of the Greater New York Red Cross Board of Directors, ran the TCS New York City Marathon, along with a team of 14 Team Red Cross runners. Every member of Team Red Cross, which included runners from New York City, Florida, Missouri, Louisiana, and even Hong Kong, ran the 26.2 mile race as a Red Cross ambassador, one who pledged to raise or donate funds in support of the Red Cross’s vital lifesaving mission of helping people prevent, prepare for and respond to emergencies. The total raised thus far is nearly $90,000. An attorney for the firm of Gibson and Dunn, Shelton, a board member since 2005, has run marathons since 2011, including the Boston Marathon in 2012. Shelton added taht he is inspired by the work the Red Cross does to make the lives of New Yorkers better; from Sandy relief to aid provided after smaller, “everyday” disasters like fires and floods. While Team Red Cross covered the 26.2 mile course through all five boroughs of New York City, about 150 Red Cross first-aid and CPR-trained volunteers and staff members, wearing Red Cross vests, worked as “spotters” who supported the New York Road Runners (NYRR) medical operations along the marathon route. See Marathon photos of runners and spotters.